Our guest letter today comes from Daniel Thompson, former roommate to our own Steve Valdez. 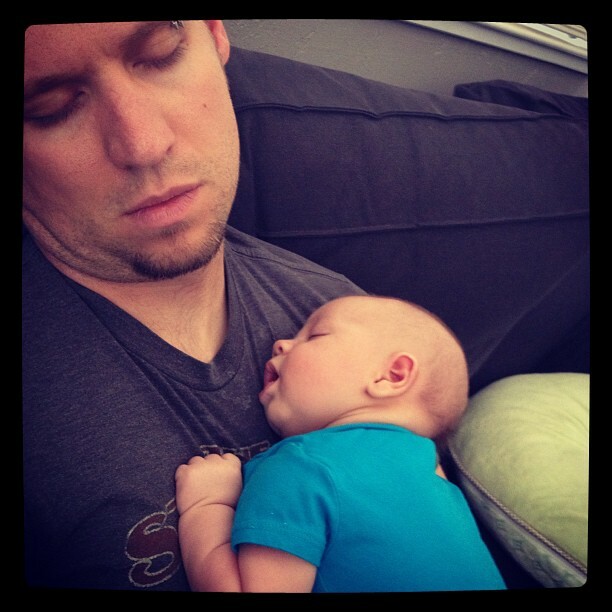 Daniel is a musician, car enthusiast, and father to 9 month old Azariah. Daniel and his wife, Jenna, live in Prescott, AZ, where Daniel works in Program Production at United Christian Youth Camp. You are an inquisitive child. You haven’t figured out your niche yet. You check out Daddy’s instruments, Mommy’s hair equipment, Daddy’s tools, Mommy’s computer (specifically mommy’s computer cables), Daddy’s sunglasses, Mommy’s cooking utensils, Daddy sports gear, knives and guns…etc, and the list goes on and on… (You may be asking yourself, “self, where is Daddy while I play with knives and guns?” The answer is, “encouraging.” Daddy is encouraging while you play with knives and guns, under VERY close supervision, of course). There’s one thing, though, that you seem to pay special attention to. This one thing, no matter how long you’re on the floor cruising, you always find yourself near, playing with, touching, tasting, smelling. You have an unhealthy fascination. Or is it actually unhealthy…? You love to press them in and listen to the resounding “thug” of its release reverberate through the rich mahogany of the piano’s shell. You love to lick those pedals, tasting for yourself the dirt and residue left from Daddy’s shoes and sweaty socks over years and years of practicing… (Whenever I see you do this I wonder to myself, “Self, when was the last time I cleaned those pedals?” Riah, the answer is “never”. )…and you do the most peculiar thing when you play with the pedals…you make sound effects…but not piano sound effects… …Grunting…groaning…growling…”grrrrr”ing… Riah, these are not the sounds of a piano. You know that. You’ve heard Daddy play the piano a hundred times…it usually makes you cry… (Real confidence booster there, buddy)… So why the grunting and groaning? Then it dawned on me… …pedals… …grunting…growling…grrrr-ing…CARS! These are the sounds of Daddy’s Jeep. There is hope for you after all, buddy. You love cruising in Daddy’s Jeep…perhaps more than you love cruising on the floor of our living room. Now I know, no matter how you turn out, whatever interests you have, wherever life leads you, we will always have a special connection: cars. I can’t wait to take you to car shows, teach you everything I know, how to fix ’em, love ‘em, build ‘em, love ‘em, mod ‘em, love ‘em, like ‘em, love ‘em. Sports? Sure. Music? If you want. Cooking? Whatever floats your boat. Cars? Let’s do it. I’m in.